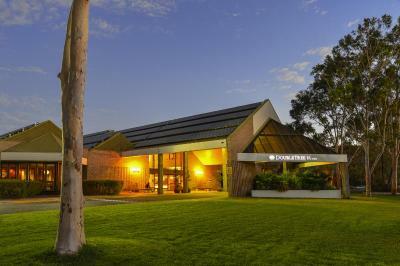 Lock in a great price for DoubleTree by Hilton Alice Springs - rated 8.2 by recent guests. The staff is friendly and the pool is nice, with the pool being long enough to do laps -- though it is a little narrow in places. Breakfast was good, though a little expensive. I liked the proximity to the Olive Pink Botanical Garden and to the town centre. Restaurants were great. Beds comfy. Pool was nice. Kids loved the peacock. The bar area was great, as was the restaurant. The pool area was lovely and the location of the hotel was good. The rooms were very clean and serviced daily. The place is in a calm area, with access to the pool till 10 pm. Free Parking, Free Wifi, the extra pillow was provided and nonsmoker room. The room size is good. Two good restaurants. Happy hour at the bar. 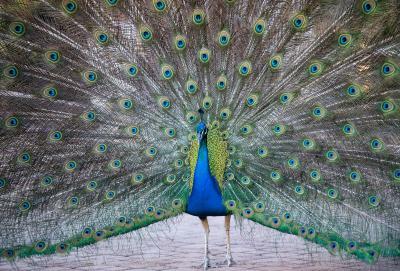 Albert the peacock. The air-conditioned rooms have balconies that overlook either the mountains or the hotel's heated swimming pool or the hotel's gardens. All spacious guest rooms and suites offer generous work surfaces, luxurious bedding and access to free WiFi in public areas. 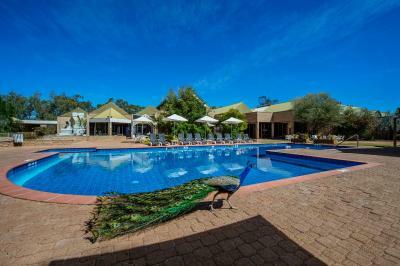 DoubleTree by Hilton Alice Springs features a fitness centre, an indoor sauna, a plunge pool and 2 tennis courts. 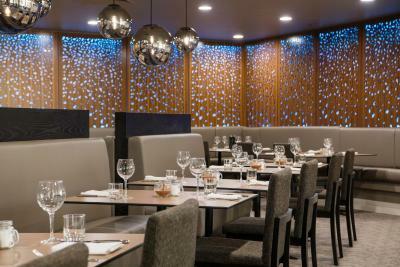 In addition to the on-site Hanuman restaurant, there is the Deck Eatery and Bar, and Springs Restaurant, offering delicious bistro style dishes. There is also a lobby bar and 24-hour room service. DoubleTree by Hilton Alice Springs has been welcoming Booking.com guests since 10 Dec 2009. 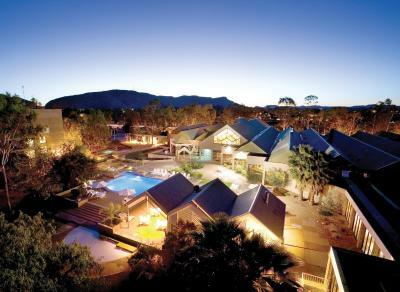 When would you like to stay at DoubleTree by Hilton Alice Springs? This air-conditioned room features lovely garden views. It also has flat-screen satellite TV, a minibar and tea and coffee making facilities. This air-conditioned room features lovely mountain views. It also has flat-screen satellite TV, a minibar and tea and coffee making facilities. Features a living/dining area and private balcony with garden or mountain views. This air-conditioned room has a wheelchair adjusted bathroom. It also has flat-screen satellite TV, a minibar and tea and coffee making facilities. This air-conditioned room features a flat-screen satellite TV, minibar and tea and coffee making facilities. This double room features a balcony, dining area and toaster. 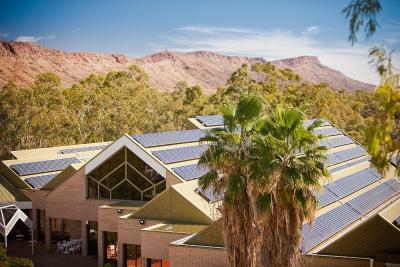 Experience eco-friendly luxury and enjoy stunning views of the majestic MacDonnell Mountain Ranges when you stay at the DoubleTree by Hilton Hotel Alice Springs. Conveniently located just off of Stuart Highway, the hotel is only 15 minutes’ drive from Alice Springs Airport and within walking distance of down-town. 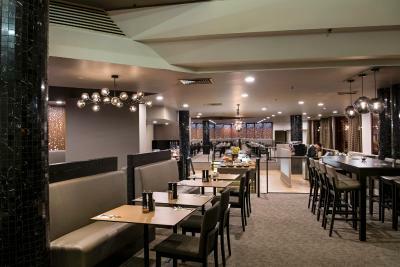 Ideal for both corporate and leisure guests, this Alice Springs hotel offers fantastic business and recreational facilities and friendly service from our dedicated staff. We will even welcome you with a signature, warm DoubleTree chocolate chip cookie when you check in. Most of our spacious guest rooms and suites offer mountain views, generous work surfaces, luxurious bedding and high-speed internet access. Work out in the 24-hour fitness centre, improve your serve on one of two tennis courts, swim in the heated outdoor pool overlooking the lush garden landscape or play a round on the 18-hole golf course located just next door. Unwind in our inviting Deck Eatery and Bar, enjoy lunch in our casual, bistro-style restaurant, Springs, or savour the highest quality, fine-dining experience in the area in Hanuman. House rules DoubleTree by Hilton Alice Springs takes special requests - add in the next step! DoubleTree by Hilton Alice Springs accepts these cards and reserves the right to temporarily hold an amount prior to arrival. Please note that different policies and additional supplements may apply for extra guests. Please inform DoubleTree by Hilton Alice Springs in advance of your expected arrival time. You can use the Special Requests box when booking, or contact the property directly with the contact details provided in your confirmation. Absolutely mismanaged restaurant. The staff was nice but a chaos. View and quite room. Swimming pool. Unfortunately, though the rooms are large and there are balconies, they are all in need of a refurbishment. At the moment the decor is dated and everything looks shabby, especially in the bathrooms. Cleanliness is not an issue, but it's obvious, especially in the bathrooms, that renovations are needed -- sooner, rather than later. At the moment the price is too high for the condition of the rooms. Also, I stayed twice in 2.5 weeks and during the first stay of seven nights my sheets were not changed once. Big walk to rooms as side door to north carpark locked. Bathrooms needed a lick of paint on walls and doors were chipped. Room was a bit shabby. Chipped paint on doors, missing a set of towels, no shower cap or body wash. Shower head was in poor condition, shower curtain old and faded. The three rooms we booked were all at different parts of the hotel. The lights in each of the rooms were quite dim. A central light might have been useful. The internet connection of guest or visitor was confusing! The music in the bar area was unusual and a little miserable ! The beds in the rooms for three couples were two doubles per room where as three king size beds would have been more appropriate! Distance from town. distance to walk from my room on the 3rd floor to the lifts and then to the reception area. The room was not comfortable. The bed was sunken in the middle. No microwave, in a hotel rated 4 stars I would expect at least a microwave. Kids pool, water was cloudy and not clean. Had to request extra towels as only two were provided for 4 people. Towels didn’t arrive for 2 hours. We were not informed of a band playing outside our room on a Sunday night. The shower dripped constantly.